I took a look back at the community on the USR Google+ page, before it disappears, though of course nothing ever really disappears from the web. A few years back, there was a discussion on playing puppets, creatures that work with a hero as a kind of support staff. Puppets and their controller — in other words, companions of a hero. In classic fantasy role playing games, this is the druid or ranger with their wolf, hawk, or other animal partner. Helper robots in a science fiction settings are a pretty popular concept too. A companion, in the terms we’re using here, is more than a simple Specialism. A private eye who has a trusty bartender informant doesn’t have a companion; he has a Bartender Contact +2 Specialism. All the bartender does is pass along information (and pour drinks). He doesn’t join the detective in a fight, and really doesn’t even leave the bar, in the story. On the other hand, a dark elf two-blade ranger’s magical black panther is a companion (probably a Magical Black Panther +2); it’s useful as a warrior, but also a scout, a guard, and likely some other stuff, I haven’t read all the books. He literally never leaves his hero. 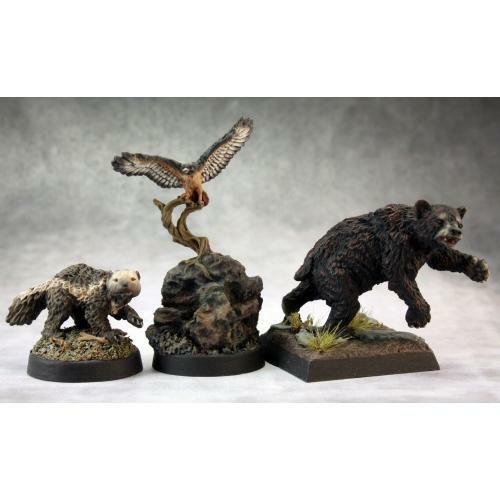 Animal companions, classic fantasy style. So, if both the bartender and the panther are designated as Specialisms, what’s the difference in game terms between a companion and a non-companion? On the surface, not much. Both offer a +2 bonus… but the panther’s bonus applies a lot more often. It all depends on how the player and the game master have decided how the companion works. That’s part of what defining a Specialism in the first place is all about — what kind of die rolls it applies to. (A) puppet could be a manifestation of a Specialism (Flight +2 is on your character sheet, but you can’t literally fly. One of your puppets can, though, and whenever you need to fly you summon the puppet to carry you). That’s just “flavor text,” as they say in CCGs. This character can fly, it’s just being described as something the puppet does for the hero. It does open the game to more role playing opportunities — what if the puppet is missing or stolen? Is the hero’s need to fly somehow powerful enough that the puppet comes racing across continents to do its job? Or is the character just a little less capable now that his puppet is out of action? Then there’s the situation where the companion is more powerful than the hero. There are a few superheroes who have this trait — young Billy Batson becomes the mighty Captain Marvel (or Shazam now, I guess), and timid scientist Bruce Banner transforms into the Hulk. Though in USR terms, Shazam and Hulk are the heroes, and Batson and Banner are the Specialisms (maybe Young Boy +1, capable of being ignored by most people, and Genius Scientist +2). But the example I was really thinking of is Aladdin, who has an extremely powerful wish-granting Genie, who is a companion, especially in the well-known Disney version of the fairy tale. The genie isn’t a character himself, because he can’t do anything until Aladdin makes a wish.